Few things in high-end audio give me greater pleasure or tempt me to more pride in our pursuit of the absolute sound than audio equipment that is both sanely priced and high performance. Under review here are two components, economically priced yet boasting excellent, even in one area quite outstanding, performance that should put paid to repeated complaints that TAS cares only about products priced for CEOs, oil barons, and hedge-fund managers. These are a Hybrid digital integrated amp and a compact disc player from NAD, a company that has few equals and no superiors when it comes to value-driven products with minimal compromise. Ten years ago I reviewed NAD’s C 326BEE integrated amplifier and judged it not only a superb bargain but also a superb amplifier, period. It was a traditional design in the good sense, offering a built-in phonostage, several line-level inputs, balance, bass, and treble controls, a headphone amp, and 50 watts per channel of NAD power, which means that it was capable of rather large short-term voltage swings, which in turn translated into a pretty impressive dynamic range that belied its nominal power. This unit, I am happy to discover, remains in the NAD line, albeit with a V2 designation, and is still retailing for $549. As its rather lengthy moniker suggests, the C 328, also priced at $549, is primarily addressed to audiophiles who are dedicated to all things digital, especially streaming. Despite its plain-Jane fascia and slim chassis—the C 546BEE CD player (see sidebar) is actually larger than the C 328—it offers a lot of connectivity and sophisticated circuitry with considerable engineering expertise behind them. There are three pairs of analog inputs: one curiously labeled “TV”; another “Streaming,” evidently meant for the analog outputs of a music server, though both will accept any line-level analog signal; and the third for a built-in moving-magnet phonostage. The remaining four inputs are digital: two coaxial and two optical, plus an antenna that offers Bluetooth connectivity for any suitably equipped device, including cellphones, tablets, and personal computers. The Bluetooth connection is not hi-res, but as I currently have no tuner it was nice to be able to pull up All Things Considered, TED Talks, Fresh Air, Film Week, and other NPR shows in the music room. Speaker terminals are five-way binding posts that, while hardly heavy-duty, are far more substantial than what is typical at this price point. There is also an output for a subwoofer. Most previous NAD integrated amplifiers, including the C 326BEE, allow the amp and preamp sections to be operated independently and have balance, bass, and treble controls. These features are banished from the C 328—the loss of the balance control especially egregious (though to judge from its absence on many control units all up and down the price spectrum, this seems to bother me a lot more than it does many audiophiles). But the C 328 does sport a button called “bass boost.” NAD’s designers figured that most customers for an amplifier of this price would likely be using it with speakers that don’t exactly plumb the depths. Engaging this button boosts bass about 6–7dB at 80Hz, adding some pleasing oomph while rolling off below that frequency so as not to tax either the amplifier or the speakers with really deep bass. Though I have no use for bass boost with my speakers, the feature did provide effective loudness compensation for low-level listening. Consistent with its digital orientation, the C 328 also contains a built-in DAC that can accept a signal from any digital component with a coaxial or optical port, including televisions, CD players, and music servers. Greg Stidsen, NAD’s Director of Technology and Product Planning, told me that the Cirrus Logic CS42528 DAC constitutes the heart of the DAC section: an eight-channel circuit that NAD implements in a “dual-differential configuration, whereby the extra six-channels are used for noise reduction and improving linearity.” Among other things, claims Stidsen, NAD is able to get approximately 10dB more dynamic range out of the Cirrus than other manufacturers who use it. Although I did most of my evaluations using the analog inputs, if your CD player is a few or more years old and has a digital output, there’s a good chance you’ll get better reproduction running it through the C 328’s DAC (see sidebar for more on this). And if you listen to your television through your stereo, as I do, and if the set has an optical output, play it through the onboard DAC for better sound as well. It should be noted that all the digital inputs are 24/192 capable. 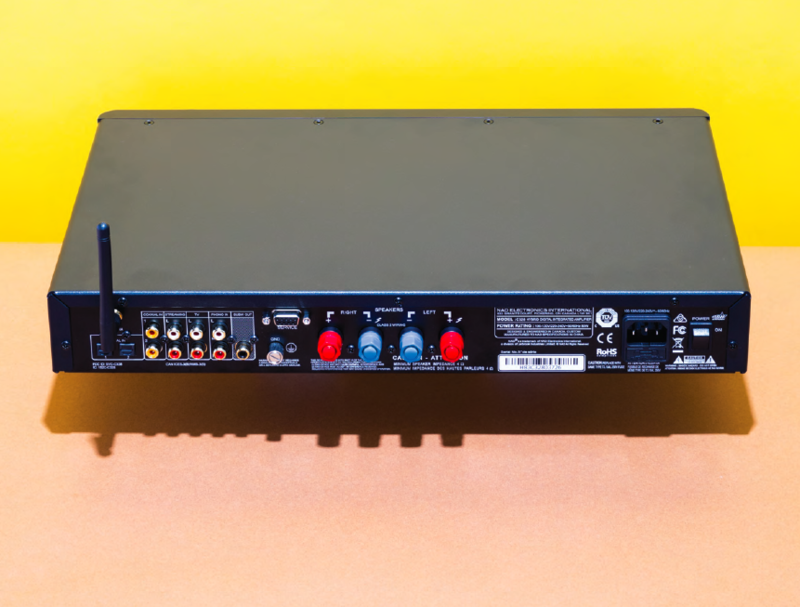 At just under 11 pounds, the C 328 is so compact and lightweight that when I first opened the box I wondered if NAD hadn’t mistakenly sent me something other than an amplifier. The weight alone clues you that this is Class D, but that’s not the whole story. NAD calls it a hybrid amp because it licenses UcD technology from the Dutch company Hypex Electronics in such a way that the performance is claimed to come very close to that of the nCore technology, also licensed from Hypex, in NAD’s flagship amplifier, the Masters Series M22 (see Neil Gader’s review). While the Hypex technology is licensed, the output stage, designed in-house by NAD, uses different FETs and reconstruction filters for higher current levels. Rated at 50 watts per channel, the design does not permit the implementation of NAD’s time-proven soft-clipping circuit, by which its conventional amps could squeeze out somewhat more dynamic range (by in effect relaxing power-supply regulation and allowing the amplifier to distort a bit more), but Stidsen says the power supply can generate 100 watts if needed and will clip gracefully. The circuit is load invariant (hence its identical power output into four or eight ohms), and claimed to be capable of better than Class AB performance (with much lower power consumption) because the eight active discrete devices greatly reduce crossover distortion. The principal bête noire of Class D amplifiers is the 500kHz switching frequency, which must be eliminated with a reconstruction filter. According to Stidsen, “Much like the output transformer of a tube amplifier, it can limit damping factor and cause uneven frequency response based on interaction with the impedance of the speaker being driven.” NAD locates the filter inside the feedback loop, which “gives a very high damping factor and flat response into different impedances.” More on this anon.